AcadiaSoft moves, on a daily basis, over $400 billion of collateral in total. Initially, the partnership will focus on helping firms with non-centrally cleared derivatives portfolios meet the operational and regulatory challenges associated with Initial Margin (IM) requirements that started to come into effect in 2016. The initiative couples Quaternion’s extensive quantitative expertise and AcadiaSoft’s proven capabilities in market standard applications allowing clients to access a range of services via the secure environment of the AcadiaSoft Hub. “Combining AcadiaSoft’s existing infrastructure with our risk analytics tools presents opportunities to create new products that will greatly benefit both the smaller players in the non-centrally-cleared market facing near-term hurdles, as well as larger, established institutions looking to reduce spend on functions that have become ‘business-as-usual’ and could now be more efficiently outsourced and standardized,” said Donal Gallagher, Chief Executive Officer at Quaternion. “We believe that the expected growth of our partnership has and will continue to allow us expand our workforce – from 30 people to some 50 people in 2020”. 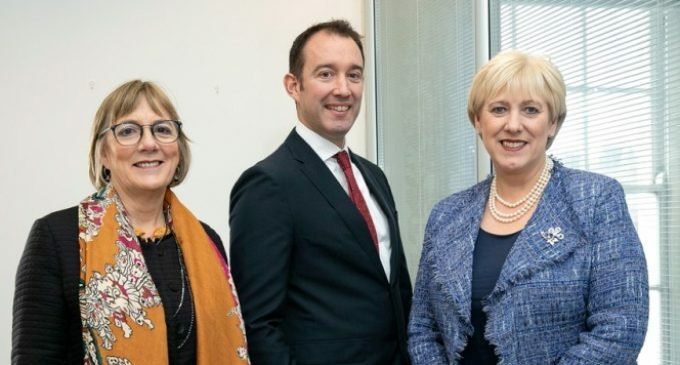 Pictured (left to right): Julie Sinnamon, CEO, Enterprise Ireland; Donal Gallagher, CEO, Quaternion; and Minister for Business, Enterprise and Innovation, Heather Humphreys, TD.